Home / Holidays/Celebrations Art / Holiday Season card Using Holly Sprig, Lg. 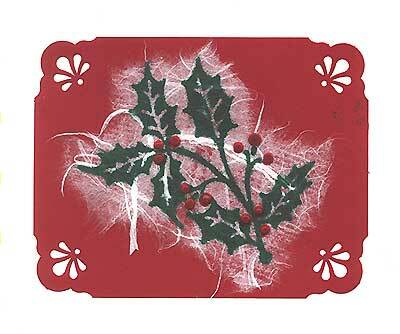 Holiday Season card Using Holly Sprig, Lg. “Holly Sprig, Lg.” was stamped on white mulberry paper which was glued to a corner punched cranberry colored piece of card stock and layered on white card stock. The berries on the holly were embossed in red. Card by Margaret Wiggin. Previous post: Holiday Card Using Snowman, Lg.